FILE - Opposition mayoral candidate Yevgeny Roizman casts his ballot at a polling station during a mayoral election in the Urals city of Yekaterinburg, Sept. 8, 2013. Russian democracy hit a grim milestone this week when Evgeny Roizman, the independent-minded mayor of Russia’s fourth largest city of Yekaterinburg, resigned from his post in protest. The mayor’s frustration was understandable: He was being forced to oversee a vote by local lawmakers to formally abolish elections to the post he had campaigned for and - against all odds - won as an opposition candidate back in 2013. With that, Yekaterinburg joined the growing ranks of Russian cities where direct elections have been replaced by Kremlin-endorsed appointees into positions of power - further winnowing opportunities, critics say, for Russians to take part in an already restrictive political life at the grassroots level. In Yekaterinburg, the decision to cancel direct elections had a key backer in the region’s Kremlin-backed governor, Yevgeny Kuivashev. Future mayors will now be chosen by the legislature from a list drawn up by lawmakers - a move Kuivashev insists will save the city money and streamline governance. But, in reality, the mayorship had already been stripped to a mostly ceremonial post, with key decision-making power ceded to a "city manager" - also appointed by Kuivashev’s pliant legislature. Welcome to Russia President Vladimir Putin’s so-called “managed democracy” - a loosely defined system that preserves the outlines of democratic traditions while meticulously avoiding the unpredictable results popular elections can deliver. Kremlin supporters argue the managed system of elections and appointees reflects Russians’ desire to simply get things done. The legislatures that approves appointees, they note, are popularly elected officials. They also argue that the ability to choose "city managers" allows skilled personnel to handle complicated public infrastructure issues that plague Russian regions and that few politicians know much about. 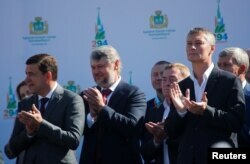 FILE - Governor of Russia's Sverdlovsk region Yevgeny Kuivashev (L) and then-mayor of Yekaterinburg Yevgeny Roizman (R) attend the opening ceremony of City Day celebrations, in Yekaterinburg, Russia, Aug. 19, 2017. Moreover, proponents of the city managers point out ineffective appointees can be quickly replaced, unlike mayors who must be voted out of office. Opponents argue the Kremlin’s real goal is to strip the country of political alternatives who challenge the Kremlin’s influence on regional politics. Krasheninnikov argues Roizman was driven from office largely because of his popular reputation as a politician who viewed Yekaterinburg’s problems through the eyes of a local - a far cry from grey functionaries imported by the Kremlin to oversee affairs. Indeed, the demise of Yekaterinburg’s mayoral elections have seeds in Putin’s rise to power some 18 years prior. FILE - People hold red balloons and signs protesting an initiative to end mayoral elections in Yekaterinburg, Russia, April 2, 2018. One of the signs reads 'Mom, I want to vote", while the other, in a Russian word play, can mean both "Voice of the people" and "People deserve a voice. Since then, the Russian leader has taken multiple steps to put that vision into practice. In 2005, Putin abolished the election of governors in favor of Kremlin appointees. (Subsequent changes now allow regions to elect governors, albeit with the Kremlin carefully filtering the list of candidates, including a bid by Roizman to run for the governorship of Sverdlovsk Oblast in 2017). That same year, the Kremlin began gutting mayoral races in favor of "city managers" and other handpicked appointees approved by pliant local legislatures. Today, every single one of Russia’s 85 governors is loyal to the Kremlin. Fewer than 10 Russian cities still hold direct mayoral elections. Even among those that do, the vast majority of elected mayors carefully toe the Kremlin line. Yekaterinburg’s Roizman - a maverick politician who criticized Putin’s recent reelection as undemocratic and has allied himself with opposition leader Alexei Navalny - was the last lone exception. While pro-democracy advocates criticize the practice in Russia, the concept of unelected managers appointed to oversee affairs is not without precedent in the West. Smaller American cities have occasionally experimented with the practice when faced with financial or other crises. Among larger cities, Detroit recently was led by a governor-appointed “emergency manager” to help guide the city out of bankruptcy. The move - temporary and, ultimately, successful - was initially challenged by locals as an assault on home rule. Still, Yekaterinburg analyst Krasheninnikov argues therein lies a key difference.